We are excited to announce that Free Flite Bicycles will be the presenting sponsor of the 2019 Blankets Creek Dirty 15/30 Mountain Bike Race. Owner Dan Thornton and the Free Flite crew have been long time supporters of SORBA Woodstock and were major contributors to the Trail Fund that helped fund the construction of the Van Michael Trail, Loop 3 of the Explorer Trail, and the Mill Trails at Rope Mill Park. Free Flite Bicycles has locations in Marietta, East Cobb and Sandy Springs. Optional early Packet Pickup from 4-7 pm at Free Flite Bicycles, Canton Road location. Please note there is a 5 and 10 mile trail run going on at Blankets Creek in the morning, beginning at 8:30 am. If parking lot is full when you arrive, please park next door at River Church. A portion of the proceeds from this event will be donated to SORBA Woodstock for their continued maintenance and upkeep of the Blankets Creek and Rope Mill Trails. From the south, take I-575 north to exit 11, Sixes Road. Turn left onto Sixes Road and go approximately 1.7 miles to Blankets Creek Trails, which will be on the left. The trails are just past the Cherokee Charter Academy School, on the opposite side of the road. The closest hotels are in Woodstock, Georgia. Camping is not allowed at Blankets Creek Park, however there are several campgrounds along Lake Allatoona, which is 20-30 mins north of Blankets Creek, depending on which location you choose. The US Army Corps of Engineers has a variety of camprounds available HERE. All entries include a T-shirt. 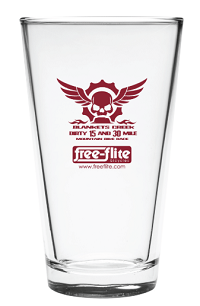 Event Pint Glass guaranteed to the first 200 who register. Sizes guaranteed in an event shirt if you register before April 6th. 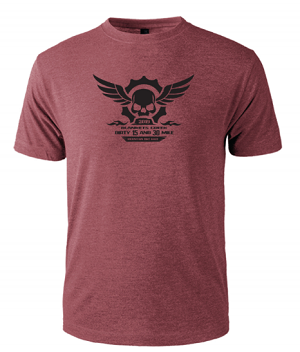 After April 6th, sizes are first come-first served until we run out of event shirts. If a size is shown in the menu when you register, it is still available. Those who register late or once we are out of event shirts will still receive a shirt, however it will be a Mountain Goat logo tee. Please register early if you would like an event shirt. Shirts run true to size. Medals and prizes will be presented to the top 3 finishers in each category. Podium Shirts will be awarded to the top finisher in each category. The awards ceremony for the mountain bike race will take place at approximately 1:45 pm for beginners and 3:15 pm for all others. You must be present at the awards ceremony, or have someone pick up your award, as medals will not be mailed. Race check-in and parking will be at the Blankets Creek Trailhead parking lot. Additional Parking will be available at River Church, which is just west of Blankets Creek on Sixes Road. Please note there is a 5 and 10 mile trail run going on at Blankets Creek in the morning, beginning at 8:30 am. If parking lot is full, please park next door at River Church. Spots will likeky start opening up in the Blankets Creek Lot around 10 am. There will be a neutral fuel/hydration station that riders will pass by on several occasions, located at the Dwelling Directional Sign. Riders will pass by this aid station before and after riding the Dwelling Trail and will also have the option to use the aid station after riding South Loop on each lap. This aid station will offer water and Torq Energy to fill bottles, as well as Torq Gels. You may leave a 1 gallon ziploc bag at this location if you wish to have your own drink mix/snacks for lap number 2. All participants will be required to wear a bicycle helmet at all times while riding. Penalty is DQ. No outside (non racer) assistance is permitted at any time during the race. Racers may assist other racers. Headphones/ipods will not be permitted. Cutting the course is not permitted. Penalty is DQ. In the event of a mechanical, the racer must cross the finish line with his/her bike to receive an official finish time. Racers must follow all race staff/volunteer instructions. Failure to do so may result in a DQ. Please exercise caution and good sportsmanship when passing other racers on the trail. You must let faster racers who are not in your category pass. Starts will be staggered by category. You must start in your assigned start wave. Penalty is DQ. Mountain Goat Adventures utilizes Chip Timing using MyLaps Bibtag Technology and features instant results posting. The race will run rain or shine, however, the Race Director reserves the right to cancel or modify segments of the event as deemed necessary for preservation of the trail and/or participant safety. No refunds will be given in the event of an act of God that requires cancellation of the race for the saftey of participants. Once the race has started, no refunds will be given due to delayed start or early conclusion of the race. If we have to end the race early, chances are, you will be glad we are doing so.